This page describes Fanon-level fan-created material. It does not conflict with Erfworld Canon, but it is not official. A non-humanoid flying unit with a resemblance to a rubber ducky. They are weak units, but in addition to having the flight special, they are also water-capable. 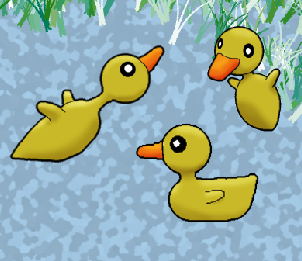 Ducky vocalizations are known to come in the form of a quack, squeak, and squack. Yellow is by far the most common color, but other variations are also possible. This page was last edited on 10 February 2011, at 13:01.